No contract or sign-up fees! Downgrade or cancel with 30 days’ notice. Membership Policies: Flex memberships are auto-pay memberships. Unused classes do not carry over to the next month. We require 30 days notice to downgrade or cancel memberships. *Flex 2 and 3 members may use their classes at any time throughout the month. Students, Seniors, & Veterans get 10% off Flex 1, 2, and 3 memberships! Full-time students and seniors over 60. Sign up in person at studio with applicable ID. **Class passes expire 6 months from date of purchase and may be gifted or shared prior to the expiration date. 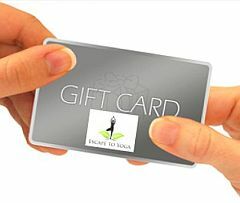 Give the gift of practice to your favorite yogi! Select the date and amount you want to send... easy! Escape to Yoga is my happy place. The studio is beautiful and peaceful, street parking is free and easy, and I love the variety of classes offered. Also, in my opinion, the monthly unlimited membership is a steal. I have been a member for four months and have yet to take a class with every teacher at the studio. However, all of the teachers I have taken classes with have been excellent. They each have their own style of teaching and bring something special to their classes. Escape to Yoga is just a really positive, welcoming environment. Whether you're new to yoga or have years of experience, I highly recommend checking it out! - Heidi S.
How often should I come to class? To realize the benefits of yoga, including increased strength and mobility, better balance, and reduced stress, we recommend that you practice two times per week or more. Never miss a beat with our flexible and affordable membership options that fit your lifestyle and budget. What a great deal! Sign me up! In order to ensure a high-quality instruction experience at Escape to Yoga, the total number of students per class is limited. We encourage all students to preregister or sign up for the waitlist when possible. You may make reservations as much as 90 days in advance and up to 15 minutes before class start time. Please arrive early to claim your spot. We will hold your reservation up to 5 minutes before class time. Cancellations less than FOUR HOURS prior to the class and no-shows will be considered late cancellations. For late cancellations using by-the-class pricing, you will lose the class pass as if you had attended the class. For unlimited pass holders, the $5 Late Cancellation fee is waived.